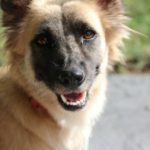 Estela is one in a million – she is a wonderful pup! She loves her walks and is so good with everyone she meets. She needs a secure back yard to zip around in – even better if it comes with tennis balls to chase! Good with kids, dogs, cats. She is treat motivated, so sweet, house broken and crate trained! Requirements for Estela: lots of playdates or trips to the dog park. She loves to play with dogs!